What an Absolutely Gorgeous Antique locket with a different eye-catching design to each side which is clearly from around the end of the Victorian and beginning of the Edwardian periods. The front features a floral and foliate design superbly framed by a carved border while the reverse is similarly styled however presents a shield shaped cartouche perfect for engraving with an initial. Inside encloses clear covers, blue tissue backing papers and frames to secure pictures of loved ones. The locket has the silky smooth feel usually only associated with solid carat gold and expected of quality antique jewellery. The gold’s hue is a very soft rose/pink gold with some yellow to the edges with a very shiny sheen. Near MINT Antique condition which is Very Rare for a locket its age! There is no wear, damage or repairs, and no dints or dents are present. 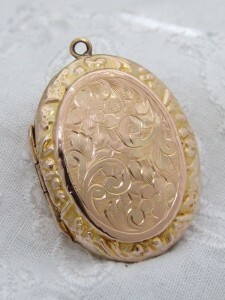 You will be thrilled with this Heirloom Quality Locket ready to enclose pictures loved ones to wear close to your heart.